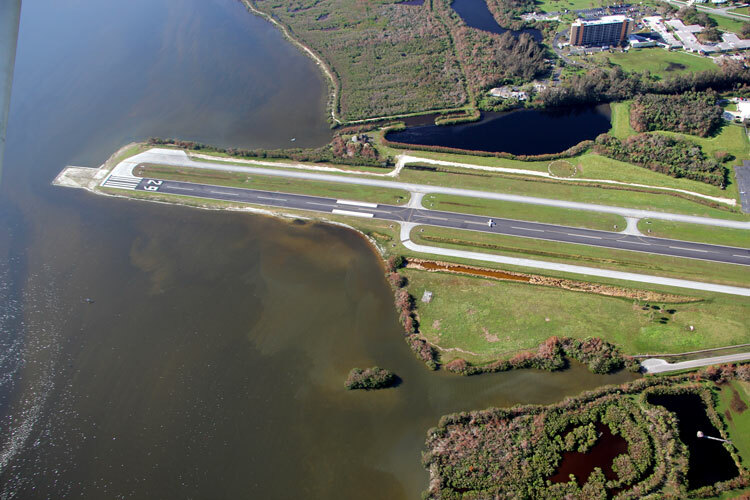 Tampa, Fla. — Michael Baker International completed a seagrass restoration demonstration project as part of a larger safety improvement program at Merritt Island Airport in Brevard County, Fla. The firm, in partnership with Sea and Shoreline, LLC; the Brevard Zoo; and Titusville Cocoa Airport Authority, harvested seagrass from the end of the airport’s Runway 29, grew it in a nursery and replanted it at a one-acre seagrass island, known as the Rodney Thompson Seagrass Island, that was created as mitigation for unavoidable environmental impacts associated with the Merritt Island Airport Runway 11-29 Safety Area Improvements project. The Rodney Thompson Island Seagrass Restoration Demonstration Project at Merritt Island Airport demonstrated specific methods for designing, planting and growing seagrass in the Indian River Lagoon. The Michael Baker team designed the seagrass island elevation based on areas where seagrass thrived in the lagoon and took the top 12-inches of soil from thriving seagrass beds in the impact area and relocated it to the island. A non-eutrophying subaqueous growth enhancing formula was injected into the sediment where the seagrass was planted to promote rhizome growth and SAVGROW herbivory protection devices were used to prevent grazing until the seagrass was established.